Jacob Haish once penned an agreement that stated he would donate $10,000 to the Northern Illinois State Normal School, now known as Northern Illinois University. He would stay true to his word, and his donation helped fund the school's first library. Below is the text from the document, dated July 15, 1895. The school was founded that same year. 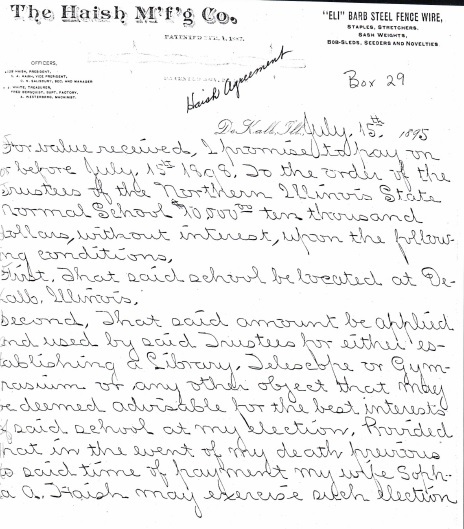 "For value received, I promise to pay on or before July 15, 1898, to the order of the trustees of the Northern Illinois State Normal School $10,000, without interest, upon the following conditions. First, that said school be located at DeKalb, Illinois. Second, that said amount be applied and used by said Trustees for either establishing a library, telescope or gymnasium or any other object that may be deemed advisable for the best interests of said school at my election. Provided that in the event of my death previous to said time of payment, my wife Sophia A. Haish may exercise such election."